Lifetime Homes originated from the early 1990’s when a group of housing experts developed particular design criteria for new homes. It provides access and convenience for disabled, elderly and other members of the public that have special needs within their new dwelling. The Lifetime Homes standard is already enforced by planners and local authorities whereby 16 different criteria are applied. Each measure is intended to make a property easier to use, more inclusive and more comfortable. Windows and doors play a huge part in the construction of new dwellings. Reynaers CF77 window meets guidelines for an accessible home. Renaers’ CF77 window now offers a great opening solution for the disabled, the elderly or those needing an accessible home. Reynaers Aluminium Systems already offer a broad range of aluminium windows for commercial and residential property. One of these is the Reynaers CS77 suite of windows. The CS77 (or Concept System 77), by Reynaers, is a modern aluminium window benefitting from the latest in polyamide thermal break technology, security and low U-Values. Reynaers CS77 also provides a range of aesthetics including Hidden Vent, Functional and Renaissance. The CS77 window now also includes a model designed for the requirements of Lifetime Homes. Features of the Reynaers CS77 Window for Accessible Homes. This new window from Reynaers meets the requirements set out in Approved Document M of the current Building Regulations. These requirements call for Category 2 and Category 3 applicable to disabled and wheelchair users. There is usually a cross-over between the obligation of Document M and the Lifetime Home Standard. 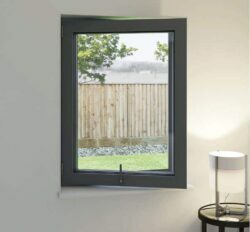 The Reynaers CS 77 Window for Accessible Homes is a tilt and turn window with an ingenious way of opening a window that traditionally has a handle on the side. Reynaers have cleverly developed the window to have the window handle centrally positioned on the bottom rail. The logical solution is that the handle is now far more accessible than a standard tilt and turn window and very easy to reach for the user. The same functions that are found in a standard tilt and turn window still apply. Turning the handle 90 degrees enables the window to turn inwards. A further turn of the handle enables the window to tilt for ventilation as normal. Large windows are catered for with a maximum area of over 2m2 and a maximum weight of 80kg. Aluminium windows are not just for residential installers. The marketing around aluminium windows would give the impression that it is largely homeowners that buy new windows. It is important to remember the vast amount of commercial work carried out in the construction of dwellings for housing associations, private dwellings and other housing requirements. We welcome the current Building Regulations that take into consideration the need for disabled users to have the same access to services and features as the non-disabled. The specification in the construction of new dwellings is broad-ranging and complex with properties required to meet these standards for current and future owners. Many publicly funded new homes must now be constructed to meet the requirements of elderly and disabled occupiers. The Reynaers CF77 window is a great feature in a home that makes ventilation, security and comfort easier. Thank you for your enquiry to the Aluminium Trade Supply Website. Our website is an information resource only and does not quote directly or provide any products. If you’d like to get in touch via our contact form with your location, we can put you in touch with local suppliers that can provide a competitive quotation.